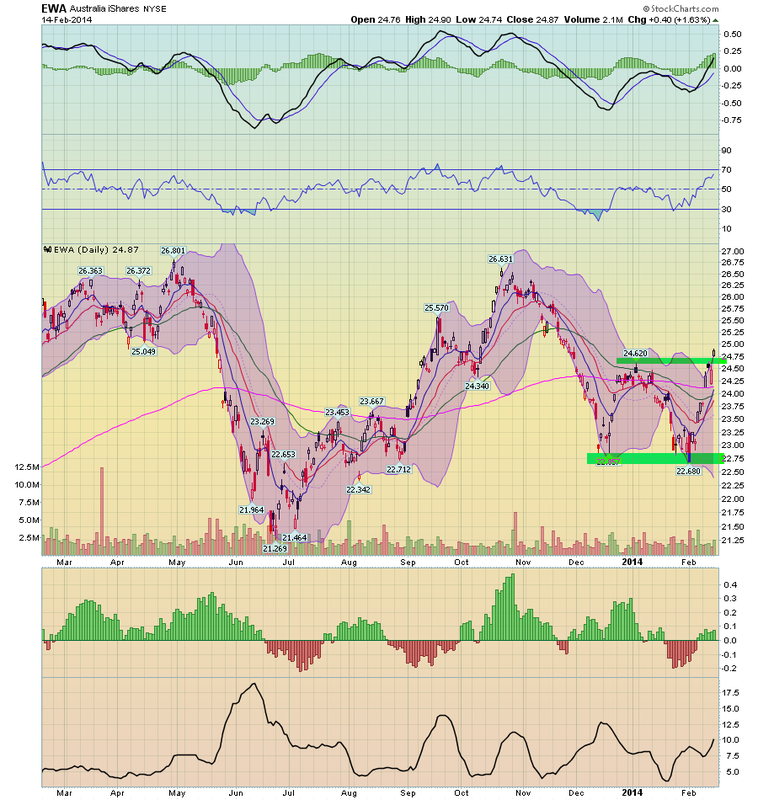 My Weekly Indicator column is up at XE.com. Those of you of a certain Neanderthal age may remember a line from The Who's "Won't Get Fooled Again": "Meet the new boss. Same as the old boss." Well, there's been a return of the old boss when it comes to economic data. 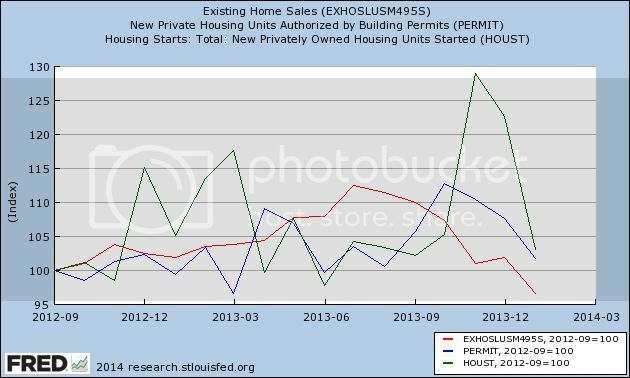 The Dueling Doomers of DailyKos horribly bobble a "housing bubble"
Ugh! You would think after years of having their heads handed to them by economic data, the Doomers might go crawl away somewhere, but every now and then, they stick their heads up and, if they don't see their shadow, figure it's OK to come out and play economic analysis. So today's lesson - alas, as usual - is about cherry-picking data. Both of DK's Pied Pipers are out today with claims that we've been in a second "housing bubble." One of them even showed up with -as we will see, fatally flawed - graphs. For those people who might amble over here from that non-bastion of economic analysis, I've been bearish on the housing market for months. So much so that I even have a charitable bet with Bill McBride a/k/a Calculated Risk that housing starts and sales will be down by at least 100,000 YoY at some point this year (he's bullish, he thinks housing sales will average +20% YoY this year). There simply is no housing bubble in the vast majority of the housing market. Even new home prices (10% of the market), adjusted both for average nonsupervisory wages and for median wages, are only about midway between their recent bottom and the bubble top. But, but, but ... what about the graphs? Most of the graphs I actually have no problem with (e.g., mortgage applications are in the tank, and housing permits and starts have stalled, as I've already documented -- like I said, I'm bearish). Again, for those of you who might come over from yon, I've examined the relationship between interest rates and housing starts for almost the last 70 years, and the simple fact is, a 1% increase in interest rates almost always leads to a 100,000 decrease in permits and/or starts within a year afterward. Most of the graphs have to do with housing sales. No problem. 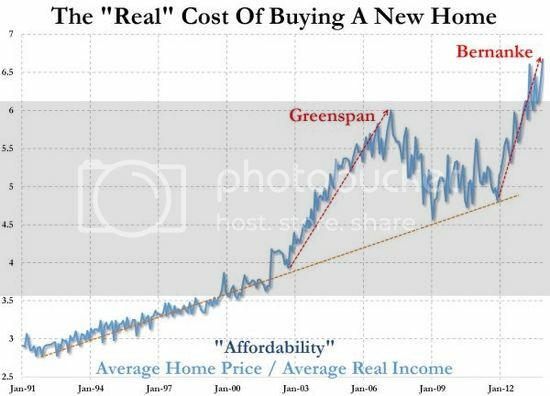 But there are two graphs upon which the claim that housing is in a bubble (i.e., prices) are based. One doesn't really prove anything, and the other is flat-out dishonest. Homes flipped in 2013 accounted for 4.6 percent of all U.S. single family home sales during the year, up from 4.2 percent in 2012 and up from 2.6 percent in 2011. Flips accounted for 3.8 percent of all sales in the fourth quarter, down slightly from 3.9 percent of all sales in the third quarter and down from 7.1 percent of all sales in the fourth quarter of 2012 — the highest percentage of sales represented by flips in a single quarter since RealtyTrac began tracking flipping data in the first quarter of 2011. In other words, Realty Trac's data only began 3 years ago, close to the bottom of the housing market. What percentage of sales were flips in 2008? 2006? 2004? 2000? 1990? Realty Trac doesn't know, and doesn't purport to know. Is the percentage of flips in 2013 similar to what we saw in a healthy market? Realty Trac doesn't know, and doesn't presume to tell us. And even within their 3 year data set, the percentage of sales that were flips in 4Q 2013 were only a little more than 1/2 of what they were a year before (3.8% vs. 7.1%). Hardly the sign of a market that is getting frothy. It's probably from Zero Hedge, although it actually isn't sourced at all. In fact it is a close relative of a Zero Hedge graph I debunked a year ago. Both suffer from the same dishonesty. They compare nominal house prices with inflation-adjusted income. If I compare the nominal price of Coca Cola from 1960 to the present, with inflation adjusted income, Coca Cola is going to look like its price has shot to the moon. Totally dishonest. 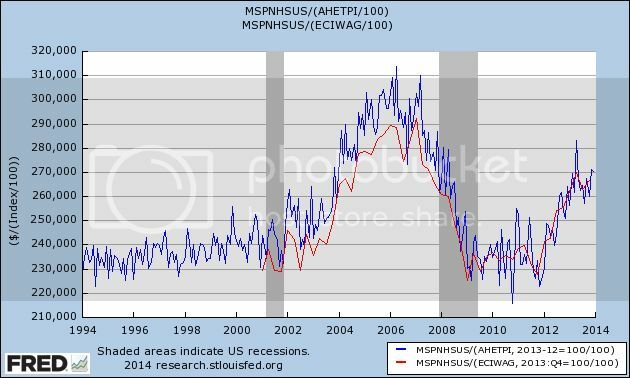 The honest comparison is nominal prices to nominal wages (what I've done above) or inflation-adjusted prices to inflation-adjusted wages. Do that, and if you find something that shows there is a bubble, now you've got my attention. Unitl then, sorry, Doomers, there is no housing bubble in the vast majority of the housing market. But if it makes you feel any better, I think the housing slowdown is going to negatively impact the economy for at least most of this year. Let me start out by saying that, in terms of their importance for the economy, existing home sales are the least signficant number, even though existing sales are about 90% of all sales. That's becuase the impact from construction trades, suppliers, landscaping, furniture, appliances, etc., is much less for existing that new home sales. But since they are 90% of the market, they dominate the housing slowdown. 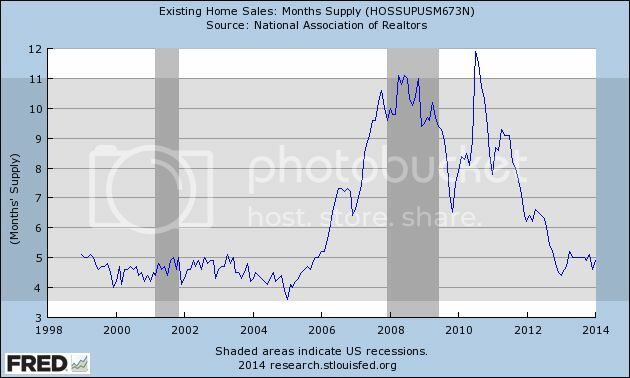 Existing home sales peaked earlier and are now lower than they were 16 months ago. All of them have declined at least 10% from those peaks. This is a little higher than during almost all of the housing boom. It may be a neutral reading, or it may be slightly supportive of prices. So measured, prices of existing homes, while more than 20% higher than they were at the bottom two years ago, still are slightly less than they were in 1999 and 2000, still far below what they were during the bubble. I appreciate that people in California may be seeing a different situation, but that's the premium you pay to live in a beautiful climate, and the astronomical cost of living in California is a big reason for the outmigration to the interior West for the last 10-20 years. All that being said, with home prices up 20% in two years, and interest rates having risen such that the monthly interest payment on a mortgage is about 30% more than it was for a mortgage in the same amount several years ago, it's no surprise that home sales have been falling. Existing home sales fell to 4.62 million annualized in January, the lowest number since July 2012 (seasonally adjusted). Median prices also fell, but these are very seasonal, and need to be compared YoY. While the median price for an existing home is more than 20% higher than it was in January 2012, as a multiple of the average wage the median price is no higher than it was in 1999 or 2000. 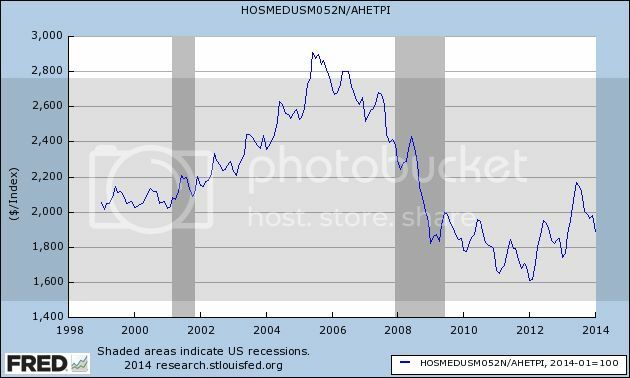 This was not unexpected, and is further evidence of a housing slowdown. More later with a few graphs. I have a post up at XE.com on this morning's CPI release. It wasn't as low as I had hoped, but we are still on track for 1.0% or so YoY inflation in February. With yesterday's reports on housing permits and starts, we now have 3 of 5 monthly reports that have turned negative YoY: in addition to starts, pending sales and existing home sales already turned negative YoY in November and December, respectively. 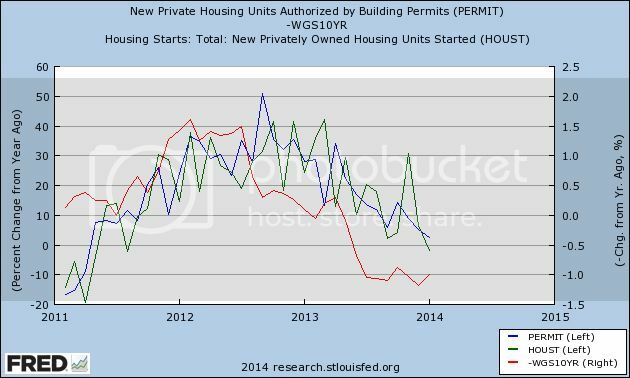 Permits and starts follow interest rates, it's just about that simple (with the exception being those few times when "buy now or be forever priced out" was a dominant theme, which may actually have played into the October and November 2013 spike). 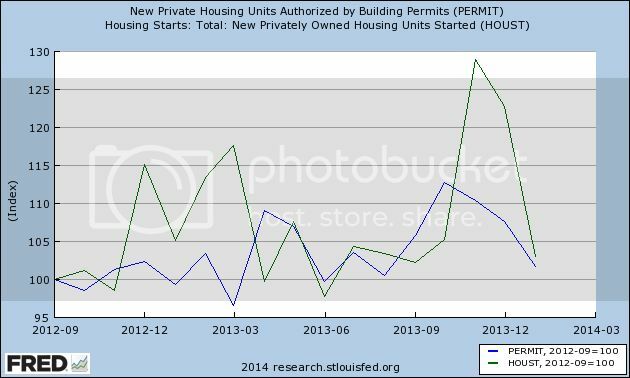 Permits have failed to advance more than 5% above their level in September 2012 in 10 of the ensuing 16 months. Starts are more erratic, with several spikes, but generally show the same pattern. While the housing data continues to confirm my belief that 2014 will be marked by a deceleration in the growth of the economy, the decline above isn't serious enough to cause me to think the economy will actually contract anytime soon. 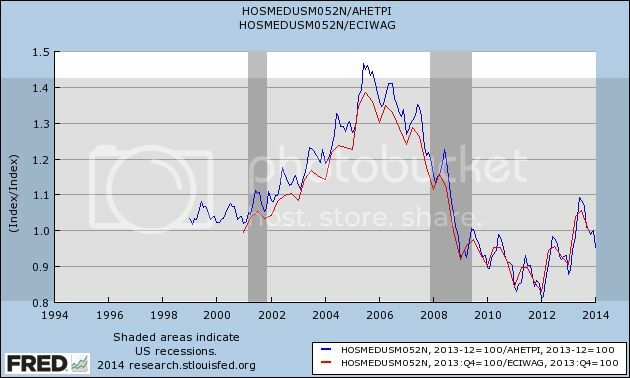 Further, I agree with Bill McBride that, over the longer term, the fundamentals favor a housing recovery. 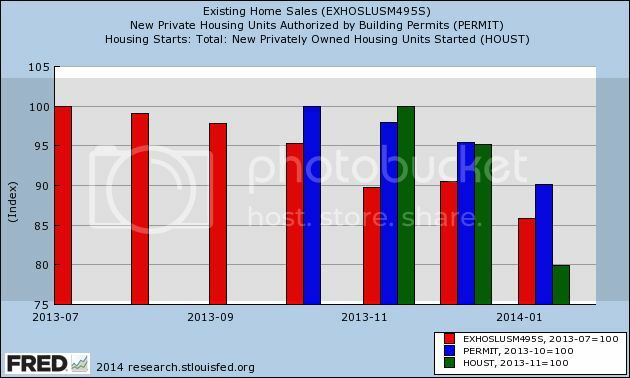 Meanwhile, existing home sales will be reported this Friday, and new and pending home sales will be reported next week. Will the 1.38 Level Provide Resistance For the EUR/USD Pair? This is up over at XE.com. As Bill McBride reminded his readers this morning, he and I have a charitable bet on the direction of the housing market this year. In the past, with rare exception, whenever interest rates have risen by at least 1%, housing permits have decreased by 100,000 a year or more. The exceptions (such as 1968 and at the peak of the housing bubble) were when "buy now or be forever priced out" was a reasonable - or widespread - argument. In 1968 it was because of secularly and rapidly rising interest rates; in 2004-05 it was because of seemingly permanently rising prices. 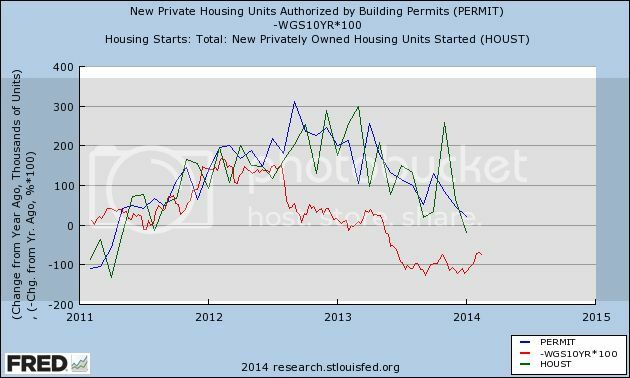 This morning January housing permits and starts were reported. 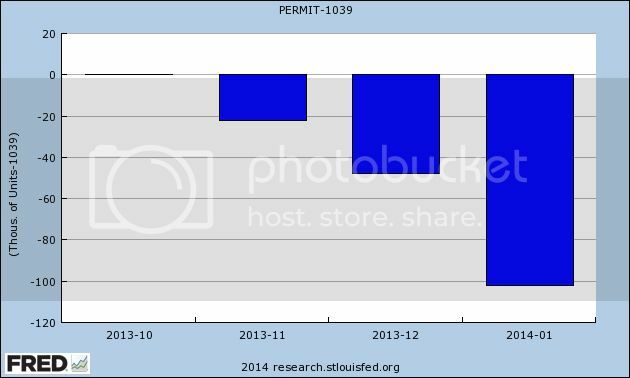 Permits fell to 54,000 to 937,000. This contrasts with 991,000 in December, and 915,000 one year ago, so permits rose 2.4% on a YoY basis. The big story, however, is that housing starts fell 168,000 to 880,000. Last month's number was revised upward by 49,000 to 1,048,000. Which means that starts are down from 898,000 one year ago, or -18,000, or -2.0% YoY. It seems obvious that weather was an issue in the January reports. And the initial anecdotal reports from February (e.g., this morning's MBA report) look even worse. But what is happening is what I expected to happen. The weather has just made it happen a little sooner, I think. PS. : I'll update with YoY graphs once they are available on FRED. Since a sell-off last fall, the Australian ETF has been trading between the upper 22s and mid 24s. At the upper end of this range has been the 200 day EMA, the line delineating between a bull and bear market. 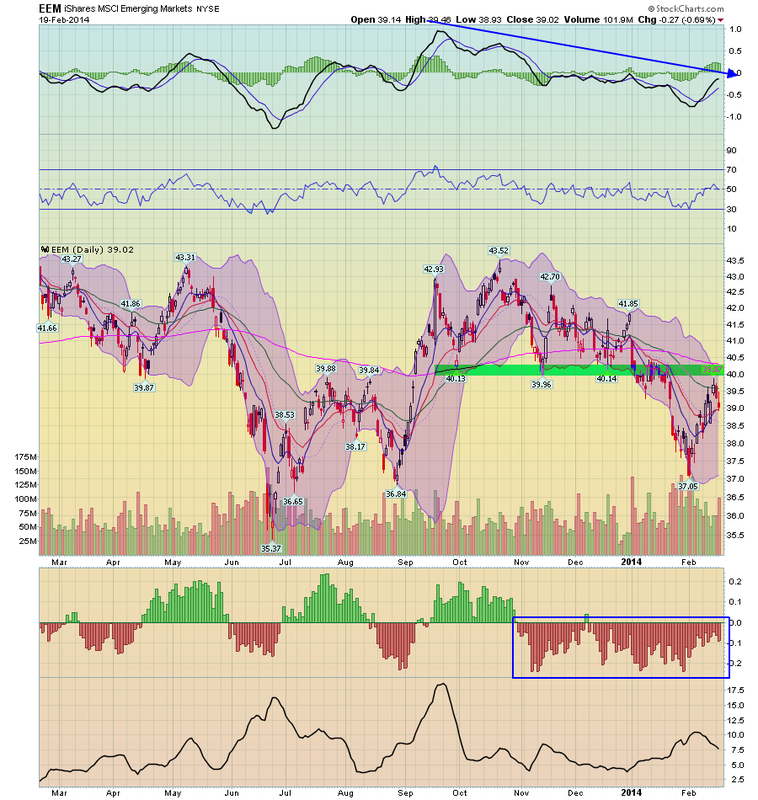 Now prices have moved through this level, with plenty of upside room to run.